Coming out of the cold winter months was a perfect time to test out skin care products that offer relief from dry skin. Now that I’m hitting the second half of my thirties, I’ve noticed a dramatic increase in my skin’s dryness, especially in my legs. So I always jump at the chance to put new skin care products to the test! This week I trialed two products from Eucerin, the Eucerin Calming Crème and Aquaphor Skin Protectant. I’ve been using the Calming Crème each night after bath time or just before bed to help ease my dry, itchy legs (after what seemed like a very long winter!) I was very happy with the feel and hydrating effect of the moisturizing crème. The Aquaphor skin protectant ointment was probably a little more advanced than what I needed, as it applies much heavier and greasier than the moisturizing crème but is advertised to act as a protection barrier to help seal in moisture (it has more of a petroleum jelly feel vs. the crème’s lotion feel). The calming crème worked well for me as a moisturizer, and it’s fragrance-free, which is a selection I always watch for when choosing dermatological skincare. 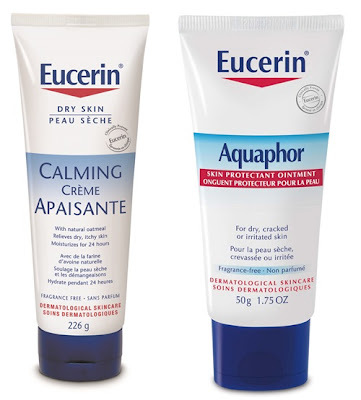 I recommend taking some time and navigating the Eucerin website at www.eucerin.ca They have a skin care advice tab that offers great tips and suggestions of how to maintain healthy skin. I’m anxious to try out the Calming itch-relief lotion with cooling menthol, as well as their daytime and nighttime anti-wrinkle creams. Right now you can get a free sample of Eucerin's new Hyal-Urea Anti Wrinkle Creame, which helps relieve your face of dry skin and reduces the look of wrinkles at the same time, click HERE! Disclosure: All opinions are my own. I received the above mentioned products for the purpose of this review. No other compensation was received.